As a former producer, I know what it means to search for voice talent. And up until now it's been a frustrating process, primarily because of the audio players. These traditional players were designed long ago for one purpose—to play a single audio track. And they do that really well! But for talent that's a big problem. Because your demo is a multi-track compilation of your performances and when producers want to jump to each track, they can't!. Your demo illustrates your top-notch work, and every track (not just the first few) is equally important. Talent deserve a professional audio and video player that's specifically designed to reveal all the tracks in their demos. My engineering background led me to analyze the demo listening process, identify the barriers and eliminate them forever. With its unique patented, track-list format, VoiceZam now offers producers a more natural and engaging experience. This means you finally have an invaluable marketing tool that provides an unforgettable playback experience for your clients—where every track in your demo is reachable. And this can notebly increase your booking rate. I hope you'll agree that VoiceZam's, "next generation" player solves the demo playback frustrations forever. My hope is that VoiceZam will pump new life into your career as a talent—because a quality demo is still the most critical marketing tool in your profession. Wrap your Demo in a professional voiceover player. 1. Your Professional NameProducers see right up front who they’re listening to. 2. Demo TypeCommercial, Narration, Promo... The Demo drop-down makes Demo selection easy. 3. Individual TracksProducers can quickly move throughout your Demo because every track is clickable. 4. Playing a TrackWhether auto-playing or clicked, every track is featured and downloadable. 5. Show Contacts PanelAll your representation and Contact information is one click away. 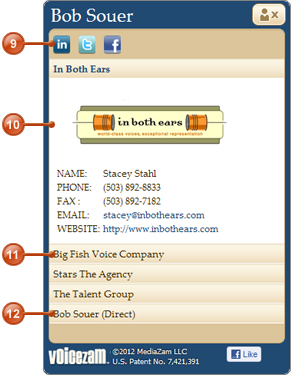 Click here to view the Contacts panel. 6. Demo DownloadOne click allows producers to easily download your full Demo. 7. Track DownloadAny Track can quickly be downloaded with it’s full title as the filename. 9. Social MediaYour Contacts panel offers user to check out your Social Media sites. 10. Representation DetailsWith one click your representation and your specific agent is featured with their full contact information. How does your current demo player compare? 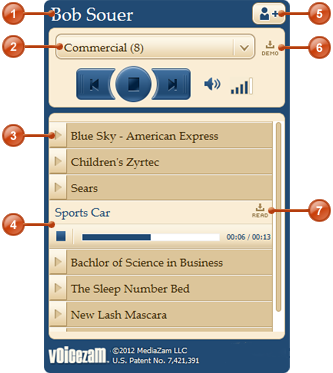 VoiceZam is the first audio player natively designed for playback of voiceover demos. 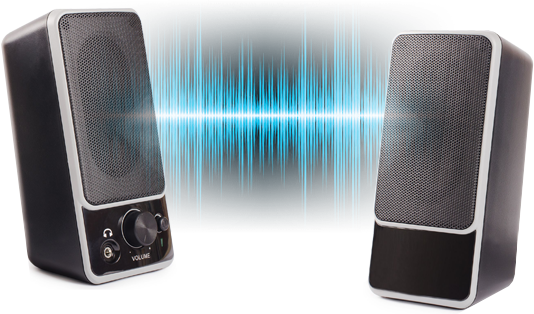 VoiceZam's track-list demo player offers your clients an impressive audio and visual experience when previewing all your voice skills. The classic, single-track audio player has been around for decades and was never designed for presenting voiceover demos. Sign Up Today for a 15 Day FREE Trial!